As many of our regular clients will know, we’ve been expanding at Franco’s Barbering Lounge during 2018, following an increase in new business. And to help meet demand for our men’s hairdressing and male grooming services in 2019, our Gloucester Road men’s hair salon has recruited three female barbers to continue delivering awesome service levels. 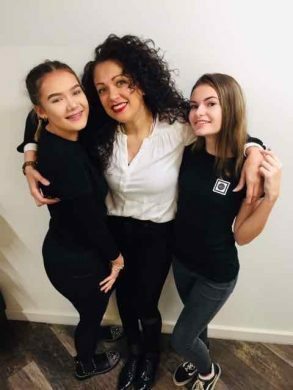 The three generations of female barbers includes Martina our recent Saturday Girl. Martina is responsible for shampooing, meet and greet for all clients, organising towels, tidying and sweeping the salon, and cleaning columns. Next up is Lilly, an Apprentice Barber. She is currently buddying Martina, and providing preparation help for clients, as well as taking calls and client bookings, assisting our team of Bristol barbers, and shampooing clients. We recently blogged here about our awesome in-house barbering training and mentoring programme, devised and delivered by Creative Director Franco Lombardi, one of the most experienced barbers in Bristol with over three decades’ experience in the art of barbering. This unique training programme will be utilised by Martina and Lilly in 2019. The third female barber addition to our central Bristol barbering team is Senior Stylist Paola, who brings an awesome level of experience to our barbering team on Gloucester Road. She has an incredible eye for detail, and specialises in skin fades, beard shaping, razor work and hot towel shaves. The feedback so far from clients on Paola’s work has been amazing. Paola is also helping to provide new male grooming services in-salon, including waxing nostrils and ears – both popular new services being requested by clients. More details to follow on this during early 2019. To book Paola, please visit here. To find out more about our expanding barber salon in Bristol, contact us here.